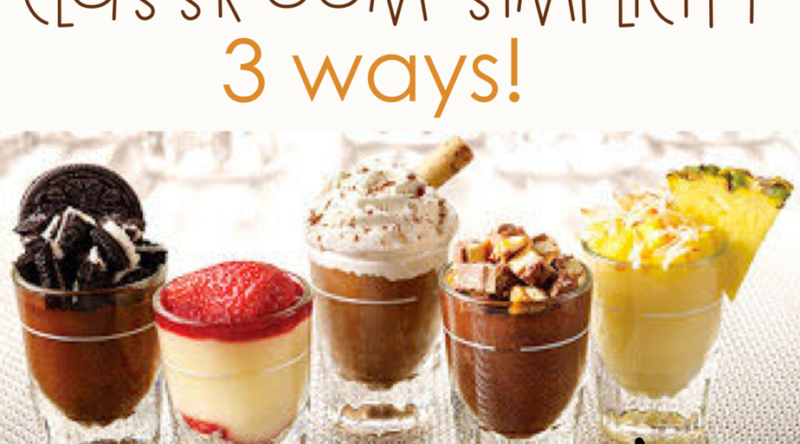 Classroom SIMPLICITY - 3 Ways! • Simplify Your Teacher Work Week! Classroom SIMPLICITY – 3 Ways! Desert 5 ways?! Yes please! Yum! Now this post is going to be a little disappointing because it has nothing to do with several ways to do dessert. Or anything delicious for that matter. BUT, I do have a few way to simplify your teacher work week! Anyhoo… here are a few things I do to simplify my work week. I don’t use a bag. I walk to and from work. 2 miles each way! And, going home is ALL uphill. Doing that walk with a heavy bag is just not fun at all. So here’s what I do so that I don’t have to worry about carrying a bag. DIGITAL STORAGE: No reason to carry a computer back and forth. I save things I will need both at home and work in DropBox or Google Drive. I’ve made sure that the computer I use at work and the computer I use at home have the same fonts installed so I never have to worry about my documents not looking right. PLAN & PRIORITIZE your SIDE WORK: Each week I plan WHEN I will do all those extras that end up taking so much extra time and so often used to end up going home with me after work. A to do list is a lifesaver, but it has to be attainable. I am now very realistic with myself. I make a doable list that is prioritized with the most imperative things at the top. If I don’t get to the bottom items, I move them to the next bit of prep-time that I have. I do not let myself take anything home unless it is something that must URGENTLY be done by the next day. I’ve said this before – but it’s worth repeating – PLAN AHEAD. Copy and plan a month ahead. Set aside one day a month to plan for the following month. You will be thankful for the extra time you spent that ONE DAY for an entire month… AND you won’t have to cart things back and forth between work and home. MESSENGER – Takes anything that needs to be delivered elsewhere (usually chooses a friend to go with him/her), puts papers into cubbies (again with a friend), and runs the pledge, calendar and morning sight word reading. LINE LEADER – Besides the obvious, the line leader is also in charge of making sure centers are clean and orderly at the end of each day. These job chart options are part of the editable Vanilla Sherbet decor line. Click to read more about the pieces in this resource. When we “grade” things – the kiddos are usually the ones giving me the answer, not the other way around. AND they cannot just tell me the correct answer. They must give the answer in a complete sentence that includes the word “because”. So there you have it. It’s not dessert. But a simplified work week is almost as good as dessert. I’m linking up with over 100 other bloggers who are sharing bright ideas with us this weekend. See the links below to check them out! Please be sure to follow me here on the blog, on Facebook, my TpT store and Instagram so you don’t miss any ideas, freebies and teacher resources! What are your favorite things to do that SIMPLIFY your work week? Love these ideas Traci!! Sooo helpful. I have had [email protected] in my teacher bag for years and it just sits there, getting heavier and heavier…Ugh! Thanks for the great post!! I am all about making your life a bit easier! Yeah for these ideas! Thanks for sharing.. picked up a few tips for sure! Do you sell the jobs in your store? I gave up on jobs because I disliked managing it but this I can do! Perfect!